Hello everyone! 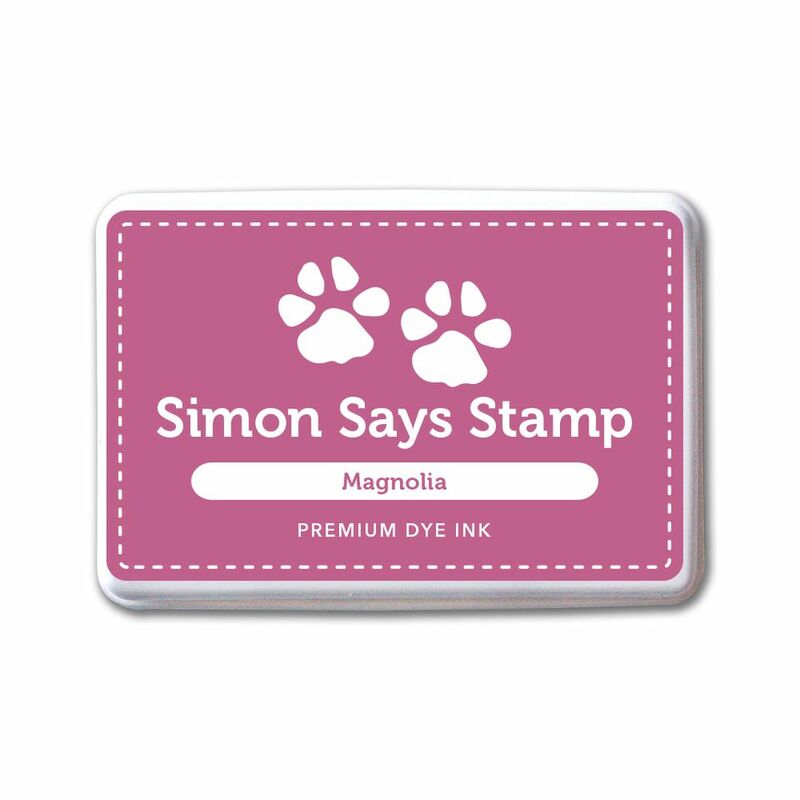 Are you excited for the latest Simon Says Stamp release, Friendly Frolic? I sure am! I had so much fun creating with this release that I made 5 different cards using many of the products in the collection! I will be sharing two of them today, two more tomorrow for Day 1 of the Friendly Frolic blog hop, plus the fifth and final card shortly thereafter. You can see all of the beautiful Friendly Frolic release products here, or in the picture links at the bottom of this post. Another aspect of this release that I am very excited about is the fact that I designed two of the products in the Friendly Frolic collection! 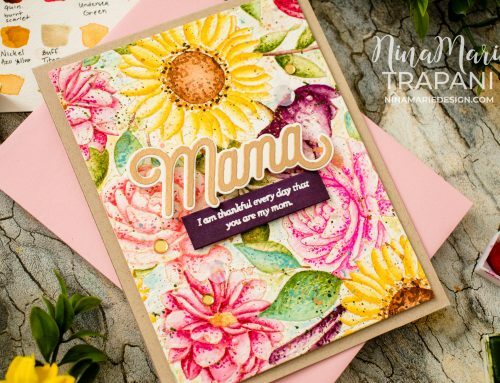 Many of you may remember my Leafy Frame stencil that I created for the Sending Sunshine Simon release; well it was so loved that it was a popular request to be released as a die too! 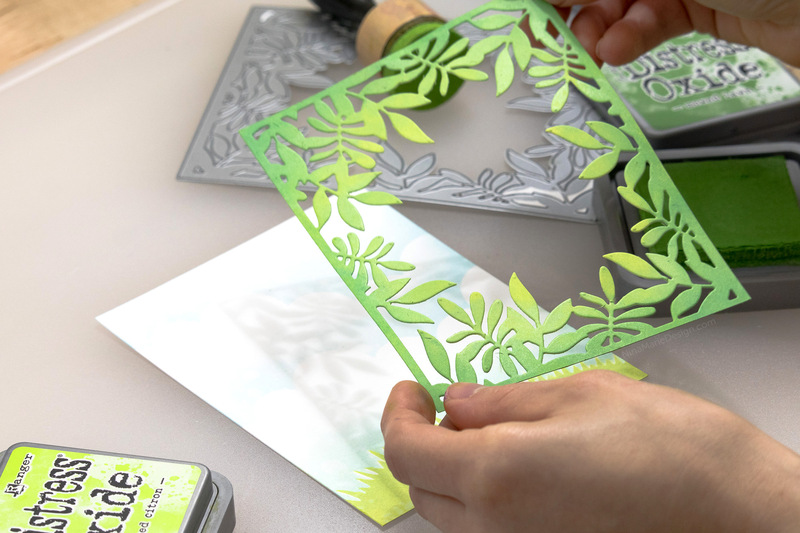 So, the Leafy Frame die is now here! I hope you love both of these new sets that I have created! Now how about some inspiration using the Friendly Frolic release?? 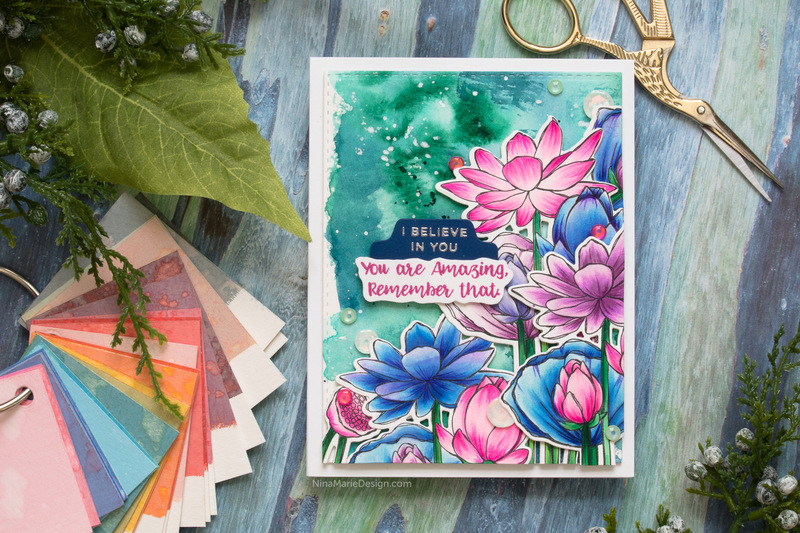 This first card features the Sketch Lotus Flower stamp set, which is so much fun to color (make sure you stop back again tomorrow to see a watercolored version of this floral stamp)! 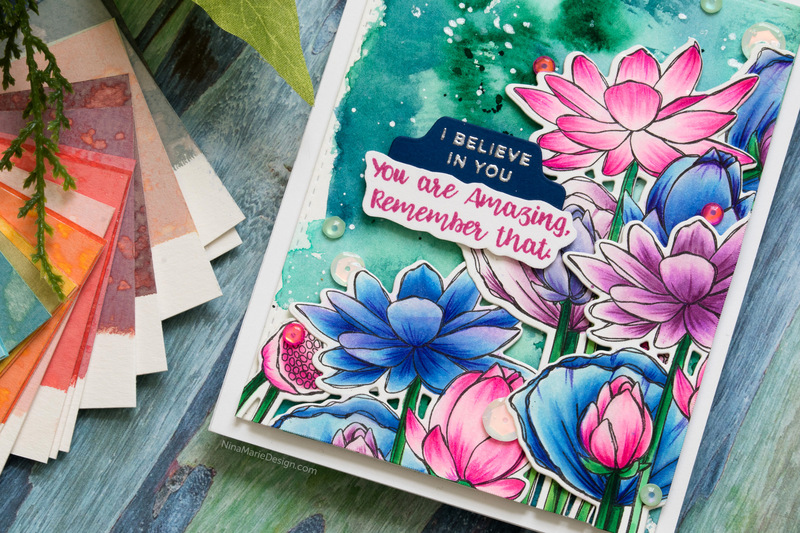 In this encouragement card, I used Copic markers to color the lotus flowers. I used the coordinating dies to cut quite a few of these florals out. I layered the lotuses onto a background I watercolored with a few colors in the Prima Essence Watercolor Confections palette. I also added pretty silver splatters onto the background for some texture. 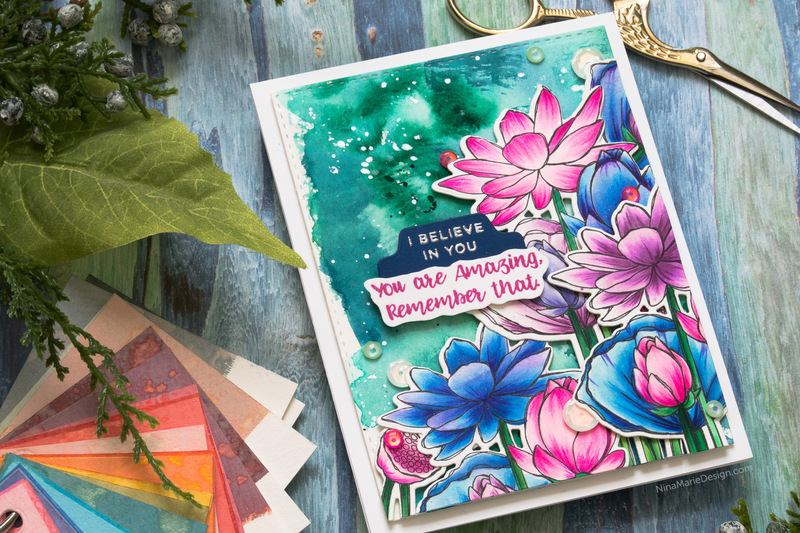 There are sentiments from the Sketch Lotus Flower and the new CZ Design Tabbed Sentiments sets. I finished off the card with a few Butterfly Kisses and Peony Bouquet sequins from Simon; there is a layer of Morning Dew Nuvo Drops in each sequin for a domed effect. These are loads of new Picture Book dies in this release, which I had a blast creating with! 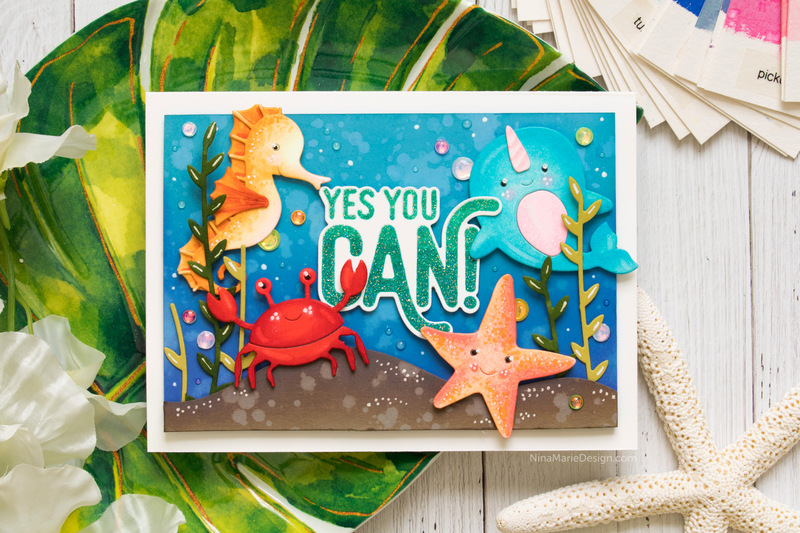 In this card I die cut each of the Starfish, Jumping Whale, Seahorse and Crab twice from white cardstock. After layering the two sets of each critter together to make a slightly thicker die cut, I colored them all with Copics. 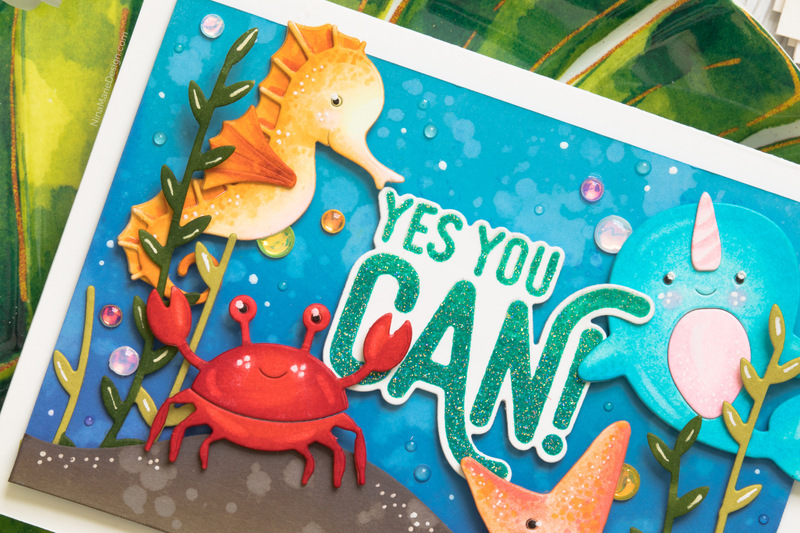 I used pretty simple coloring on these sea creatures (about 2 shades for each color) to maintain a more whimsical feel to this card. The scene behind the creatures was ink blended with Distress Oxide Inks; Walnut Stain on Narwhal cardstock for the sand, and Broken China, Blueprint Sketch and Wilted Violet on Cornflower Blue cardstock for the water. I love the look of ink blending on top of colored cardstock because when you flick on water splatters, you see the color cardstock show through, instead of a tinted white. Behind the sand is some “seaweed” that I created using the Leafy Vine Collage die from Poppy Stamps. I had cut it from Green Apple cardstock and colored a couple of the seaweed pieces with a Copic marker for a slight variation in tone. 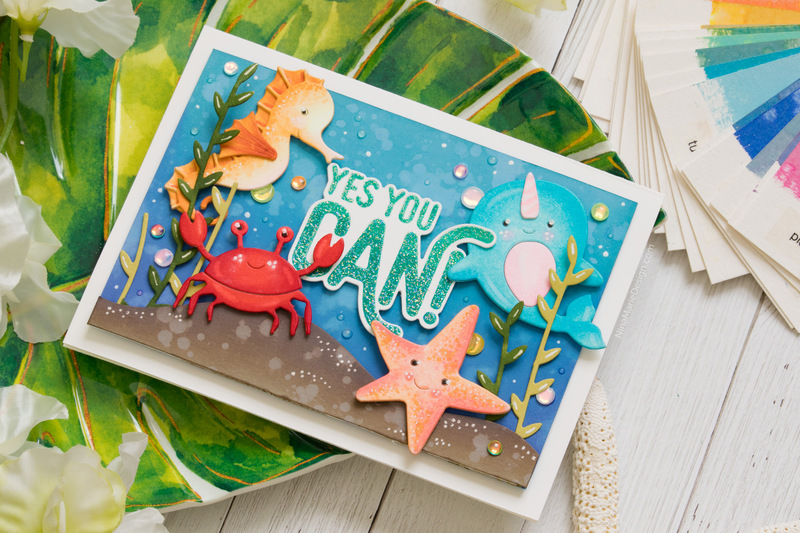 That Yes You Can sentiment I stamped with an “ombre” of Scuba and High Dive inks, then heat set my current favorite, Singing in the Rain embossing glitter from Wow on top of the greeting for some sparkle! Finally, no underwater scene can be complete without some bubbles! I created a bubble effect by putting Morning Dew Nuvo Drops into Simon’s Groovy confetti mix, as well as adding dots of Nuvo Drops and Signo white gel pen around the sequins. I hope you enjoyed these projects and were inspired to create with this fun, Friendly Frolic collection from Simon Says Stamp! Before you go, I have some news tid-bits to share with you, of things worth checking out this week! Simon is hosting a 2-day blog hop on July 27th and 28th! There will be lots of talented designers joining in the hop, sharing ideas using the new Friendly Frolic release! I’ll be part of day 1 on the 27th, so be sure to stop back and hop along! Finally, I would highly encourage you to check out Simon’s inspiration gallery for this new release, as there are new ideas and tutorials added to the gallery all the time! And the cool part is, when you create with products from the Friendly Frolic release, YOU are encouraged to add your projects to the gallery too! You can find the galleries HERE. Thank you so much for visiting with me today! I hope I will see you tomorrow! Sea creatures was my favorite. FANTASTIC!!! 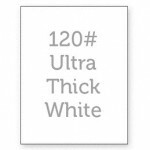 What great groop of cards. GREAT JOB!!! Very well done Nina. Congrats on your 2 newest releases! 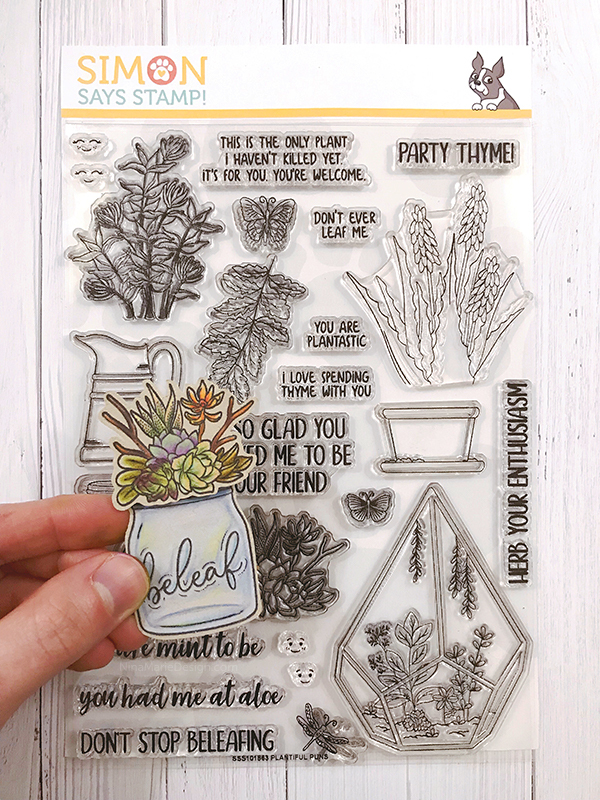 I love the Leaf Frame die and the Sketch Lotus set so I was excited to see them here. Looking forward to the hop! 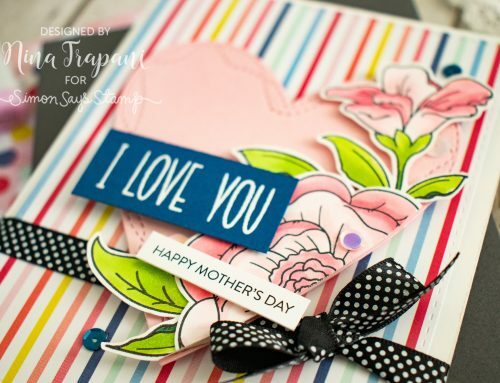 Lovely inspiration cards. I love the products you have designed, especially the Leafy Frame. Beautiful cards! Just lovely. Thanks for the inspiration! Very cool cards! I love the sea horse!! Wow Nina you made a bunch of nice cards!! !